Use Outlook 2013 or Outlook Web App, to schedule a Lync meeting. 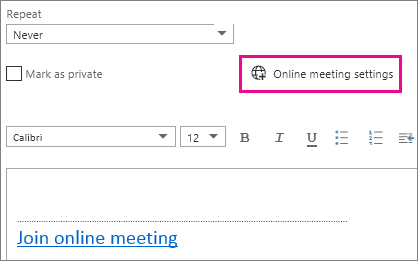 Use Outlook 2013 or Outlook Web App, to schedule a Lync meeting similar to the way you use Outlook to schedule regular meetings. When you add a Lync meeting, a link used to join the online meeting is automatically added to your meeting request. And, if your account is configured for dial-in conferencing, the meeting request will include call-in information (phone number and conference ID). Tip: For an interactive guide to setting up Lync Meetings—including troubleshooting tips—see Scheduling and preparing for a Lync Meeting. If you don’t use an Outlook program (or Windows), you can set up new meetings by using Lync Web Scheduler. Access it at https://sched.lync.com, or learn more at Lync Web Scheduler. Watch this video or follow the steps in this section to learn how to schedule a Lync 2013 meeting by using Outlook 2013. On the Home tab, on the Lync Meeting ribbon, click New Lync Meeting. Note: If Lync is installed on your computer, and you don’t see the New Lync Meeting button, follow the steps in the Lync Meeting control is not displayed on the Outlook 2013 ribbon article to resolve the issue. For details about what options are available and when you should chose them, see Set options for Lync Meetings. To set up a meeting by date, click the Calendar tab, select the date, and then in the upper-left corner, click New Event. Tip: If you get a message from you popup blocker asking if you want to allow this, select Always Allow. Tip: To add a contact or group, on the People tab, in the upper-left corner, click New, and either click Create Contact and type in the requested information, or click Create Group, type a group name, click the Members text box, and then type the email address of the person you want to add. As you type, the Search contacts and directory link appears to offer suggestions; if you see the contact’s name there, click it. When you're finished adding users, click Save. Call-in details, such as a Join online meeting link appears in the message area. If your account is configured for dial-in conferencing, you’ll also see a Find a local number link. Your Office 365 subscription does not include Lync. You’re logged in as a user who hasn’t been granted a license for Lync. Set up the meeting as you typically would, that is, by giving the event a name, adding or removing attendees, choosing a start time and duration, and so on. If you’ll have in-person attendees, in Location, type a location for the meeting, such as a conference room, or click Add Room for help finding a conference room. Tip: To look for a time that works for everyone, click Scheduling Assistant, at the top of the meeting window. To view settings for who has access to the online meeting, who has to wait for you to admit them into the meeting, and who can present during the meeting, click Online meeting settings (just above the message area. (Optional) In the meeting area, you can type an agenda. Be careful not to change any of the online meeting information. If you need to discuss a subject that requires immediate attention, you can quickly start an ad hoc meeting with Lync. See Start an impromptu Lync Meeting.